The Gerber ® Folding Spade™ is the finest folding shovel available, being the only one approved for use by NATO. 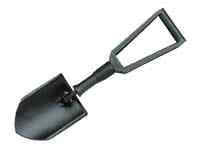 It’s the lightest, strongest, most compact spade ever produced. Gerber®’s Folding Spade folds down into a compact package and stores in its own rugged sheath for easy transport. This makes it ideal for tossing in a pack, under the car seat, in a boat, or anywhere space is limited.